Although I had previously posted this recipe on another post, I thought it really deserved it's own. I really haven't tried many other pizza dough recipes, but I finally mastered this after many, MANY tries. 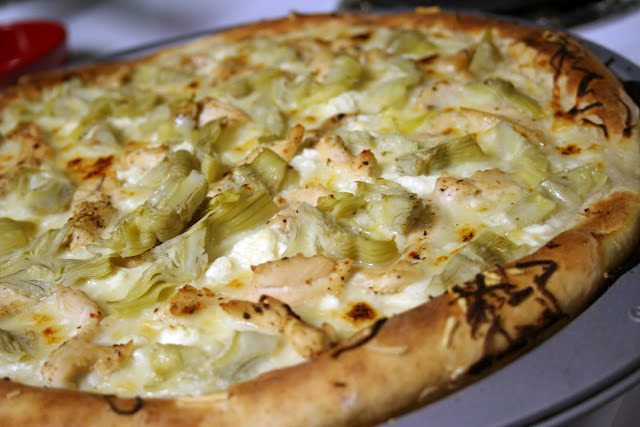 I've had pizzas that stuck to the pan, that were too gooey inside or were overdone. I finally can say that I make a really good pizza. It's all about mastering the dough and knowing how it cooks. My favorite thing about this recipe is that it doesn't need to rise. I don't have the patience or time for dough to rise and this dough always puffs up in the oven anyway. So here's a post for the best pizza dough. 1. Preheat oven to 475 degrees F. Mix with fork 1/2 cup flour, sugar, yeast and salt. Add warm water and oil. *Add 2 1/4 cups of flour. Knead the dough by hand or using a stand mixer. Roll out dough to desired size. Spray pizza pan or baking sheet. 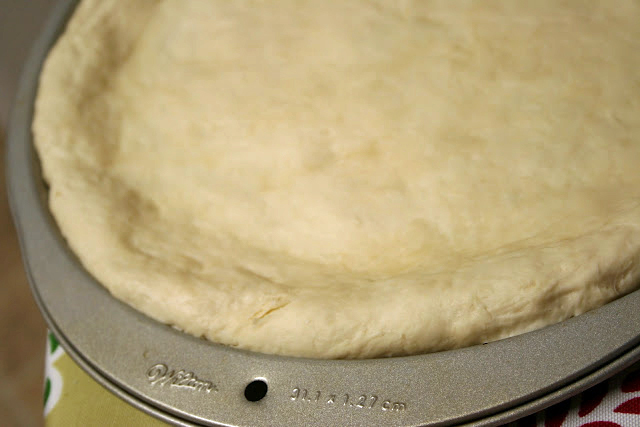 Spread dough with the palms of your hands until it fills the pan and so there is a raised edge for the "crust" as pictured above. 3. Remove and add sauce, cheese and toppings. Bake for 15 minutes. *If dough is sticky, add a little more flour: about a tablespoon at a time. This is the best dough recipe. It's hard for me to plan hours in advance of when I'm going to be hungry so I like that it doesn't have to rise too. I just put a seafood pizza in the oven. I'll tell you how it turns out. I'm so glad you've tried this recipe and it worked out! I love that this dough doesn't have to rise because of time and the fact that my apartment is never warm enough. What did you put on your seafood pizza and how'd it turn out?